If you walk along the left bank of the Danube, on the promenade next to Eurovea shopping center, you can feel a new modern, cosmopolitan flair in Bratislava. It’s not just those lively restaurants and bars close to the river, but above all a variety of high rise residential and commercial projects (e.g. Panorama City, Sky Park or Twin City) in the Pribinova and Nivy zone that shape or will shape a new skyline in this fast-developing area. While buildings in the Slovakian capital rise higher and higher, price growth for residential real estate in Slovakia recently underperformed, at least compared to many other countries of the dynamically-expanding CEE-region. In contrast to the Czech Republic or Hungary, pre-crisis price levels are still a decent way to go in Slovakia. Despite an acceleration in Q4 2018, average growth in 2018 (+5.2 percent year-on-year) was lower than the year before (+6.3 percent year-on-year). 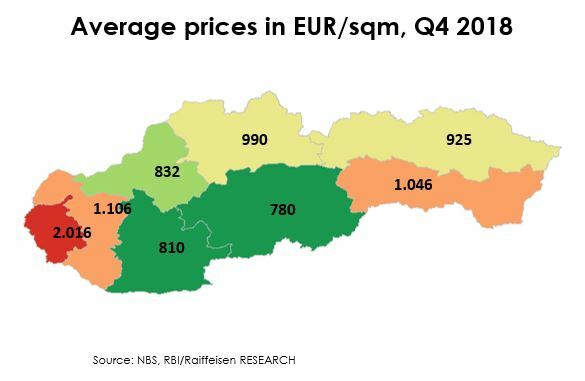 In absolute terms, the average price at the end of 2018 reached EUR/sqm 1,463. Bratislava, the unquestioned economic and cultural center of the country, remained the most expensive region with EUR/sqm 2,016. Compared to Vienna, which is located just 80 kilometers west of Bratislava, the Slovakian capital still offers relatively attractive yields for investors. While average prices are only roughly half of the Viennese level, rents are somewhat closer together. 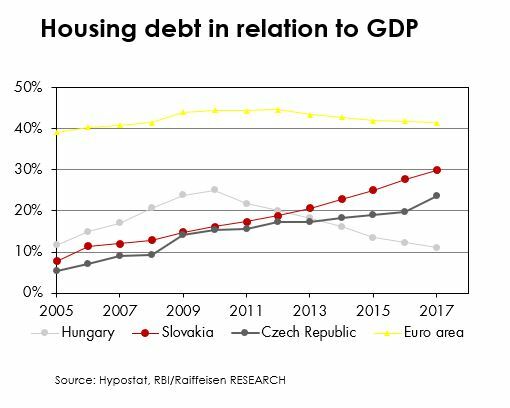 We attribute this to several factors, ranging from an underdeveloped rental market in Bratislava – structurally Slovakia has one of the highest home ownership rates in the European Union – to publicly driven deflated rents in Vienna. While Vienna and Bratislava are already the closest capital cities in Europe, the extension of the railway connection in the North of Vienna (expected to be finished by 2023) will bring the cities even closer together, leading to a reduction in commuting time to only 40 minutes and likely better integrating both real estate markets. The production of new dwellings in Slovakia clearly increased in 2018, bringing the market closer to equilibrium. However, with around 19,000 dwellings completed last year, in our opinion current supply levels are still not sufficient to cover estimated demand. Nonetheless, a strong development of new starts in dwelling construction suggests a continuation of the positive supply trend, making a balanced demand-supply level more likely in 2019. In the long term, as in many other CEE-countries, demand will be negatively impacted by an aging population. Especially the core age group of potential buyers (30-50 years) will be shrinking considerably in the upcoming decades. With respect to valuation levels, fundamental indicators do not indicate a strong deviation from long term trends. So far, the current cycle was not accompanied by an erosion of affordability as observed in other countries. In Slovakia, affordability-levels were positively shaped by strong labor market performance with considerable increases in real wages (e.g. 2017: 3.3 percent year-on-year, 2018: 4.0 percent year-on-year). In addition, the year-long downward trend in interest rates supported affordability as well. Looking at this rather bright picture, what’s the other side of the coin? Above all, ongoing favorable conditions in the mortgage market literally lead to an explosion of housing debt in the past decade. Between 2007 and 2017, the ratio of outstanding housing loans to GDP grew from 12 percent to 30 percent, surpassing countries like Austria or Ireland. Despite regulatory initiatives (see below), housing loan growth remained strong at the beginning of 2019, with a plus of 11.2 percent year-on-year in January. Obviously, with effective annual interest rates partly below German levels, borrowers still face golden times. Yet against the backdrop of a still positive macro-economic outlook (though risks, especially a weakening of the important automotive sector, are clearly looming and have the potential to challenge the wage growth story in the future) and strong but not excessive increases in residential property prices within the current cycle, why is the substantial expansion in the housing loan market of particular concern? Looking at the situation of Slovakian households, there are three main factors that indicate a heightened vulnerability. First: despite regulatory measures taken by macroprudential authorities, credit growth (so far) continued almost uninterrupted. In fact, a slight deceleration in growth rates was observable the last year, but this was also fostered by a basis-effect. Absolute growth in the market remained virtually unchanged. Second: net financial assets of households in relation to GDP are the lowest in the European Union. Consequently, there is a relatively small cushion left in case of a market downturn. Third: compared to the EU average, there is a higher concentration of housing loans in lower income households (below 60 percent of the median income), which might be dangerous if market conditions fade. On the other hand, the latter argument is at least mitigated by the fact that overall less property owners have loans outstanding, meaning the overall penetration in the population is rather low. More macroprudential measures to come? 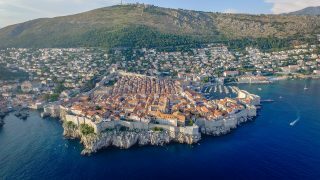 On a positive note, like in the neighboring Czech Republic, regulatory authorities already took action. As Slovakia surrendered its ability to design its own monetary policy in the course of the country’s accession to the euro area, the National Bank of Slovakia’s (NBS) portfolio of measures focuses on macroprudential tools. In this context, the countercyclical capital buffer will increase further, from currently 1.25 percent to 1.5 percent on 1 August 2019, effectively making lending costlier for banks. In addition, the NBS tightened borrower-related upper-limits (e.g. 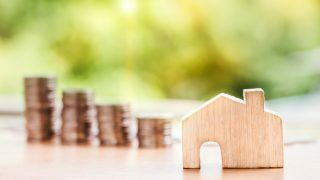 loan-to-income, loan-to-value ratios) in the summer of 2018, with the full impact expected to unfold only after the phase-in period that ends at 1 July 2019. From a social angle, in the past a regulatory-driven tightening of lending conditions with the aim to curb household’s access to credit was oftentimes backfired by opponents who argued in favor of good accessibility to credit in order to facilitate the mantra of high home ownership. This time we hope that lessons from the past have been learnt: what’s really needed is ongoing regulatory vigilance. From today’s point of view, regarding the almost uninterrupted housing loan growth, latest developments in ECB monetary policy and structural weaknesses of the Slovakian housing loan market, we think current measures might still not be sufficient to curb a further build-up of systemic risks. In this context, we cannot rule out more macroprudential measures to come on the agenda soon. Michael Heller, CFA, is Real Estate Investment Analyst at Raiffeisen Bank International in Vienna.